1.2 Who Are Elite Health? This testosterone booster from Elite Health looks very professional and clean cut. There’s a hint of ‘pharma’ about it which could lead you to believe that there’s some clinical use. This makes you almost believe that Elite Testo is a product which would be prescribed to someone who has low testosterone rather than a muscle freak looking to add even more testosterone. Considering that health and fitness supplements are so widespread these days it makes sense to broaden the appeal and potential market. More and more men are now aware of low testosterone, and more men want to rectify that. 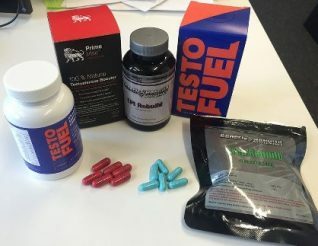 However, bottles of testosterone booster supplements called ‘testo rage’ or ‘mutant test’ may not have the same appeal as a product that looks neat, clean and essentially a medical product. This is where Elite testo fits in. Which ever way you look at it, you would expect it to work. It just looks a safe bet. it looks trustworthy. They claims to be a clean health nutrition brand. I think that means that their products are inclusive of the best ingredients that have no unwanted side effects. Elite Health say that they only provide supplements that can enhance your diet and nutrition plan rather than formulate something that can try to give you a short cut to weight loss. This they believe can be detrimental to your health. In an audacious move, Elite Health claim that Elite Testo will increase testosterone levels within 3 days. We should expect to see improvements in our mood, energy and increase workout performances. At least there is a 60 day money back guarantee should they be wrong. This test booster contains two variations of arginine, or rather it is arginine paired with two different salts. This is quite important because each of the salts (hydrochloride and alpha-ketoglutarate) help improve intestinal absorption. That is because arginine has a poor gastrointestinal intake. As a result, even though arginine can theoretically increase blood flow and the production of nitric oxide it rarely is that effective due to poor absorption. However, furthermore, some studies have unreliable and conflicting results that have demonstrated that it has no actual effect. If you were not particularly impressed with how ineffective arginine is due to its poor bio-availability citrulline could potentially cheer you up. Whereas arginine can theoretically improve blood flow and nitric oxide levels citrulline actually can deliver those promises. In fact citrulline is better at increasing arginine than supplementing with arginine itself. So citrulline can increase and improve endurance, it can aid delivering more oxygen and nutrients to the muscles. That said, any claims that citrulline can increase power output are not validated. I’m not entirely sure why this has been included unless Elite Health are trying to mimic the benefits of increased testosterone. That is because alpha lipoic acid has strong anti-inflammatory capabilities which may be able to reverse some signs of ageing by reversing oxidant damage. Also, it is worth adding that an increased level of inflammation can promote chronic disease such as obesity and will reduce natural testosterone secretion. This amino acid help produce proteins which help increase muscle development. Humans do not produce histadine so we must source it from foods. However, apart from enhancing growth and development it can also prevent obesity and metabolic syndrome. Norvaline is an amino acid which falls within the subclass of BCAA’s. With norvaline being an analogue of isoleucine. Niacin is known for its ability to reduce cholesterol levels. It is then considered that niacin can also contribute to reducing the risk of cardiovascular disease. However, this has not been scientifically verified to date and it seems that niacin may also increase insulin resistance which can counteract any perceived benefit. People also use large quantities of niacin to flush their system in order to pass urine tests, however, this is not effective. We should take two pills per day but this will only include a combined dose of 980mg. This is much lower than we should expect considering the amounts required per ingredient for them to be effective. Theoretically there are some beneficial ingredients that can have a number of positive health benefits which would include reducing inflammation, increased blood flow, improved physical endurance combating obesity as well as preventing diabetes or treating diabetes. One ingredient also shows promise as being able to improve testosterone levels. However, the associated studies set out required doses for such effects, and this product falls too short to offer those necessary doses. As such, any potentially health benefit will not be attained. Quite surprisingly, considering this is a testosterone booster supplement there seems to be a real lack of ingredients that can potentially increase testosterone. Only norvaline seems to have an effect on testosterone levels but that was in rats who were induced diabetes. So, as a result, things looks patchy at best. However, the other ingredients mainly have recorded health and physical performance benefits but this can only be acquired through sufficient doses which this supplement falls way too short on. Therefore, Elite Testo will fail to have any positive effect on testosterone levels. Citrulline malate enhances athletic anaerobic performance and relieves muscle soreness. Pérez-Guisado J, Jakeman PM. J Strength Cond Res. 2010 May;24(5):1215-22. doi: 10.1519/JSC.0b013e3181cb28e0.